Sometimes we can see this game on events such as renaissance or medieval picnics. It matches “old nature” of this game. This game – like any old game – has many variants. Those variants deserve for separate entries. Today, I will describe the simplest version of the game, known as “fox and geese”. Remeber, that there are other game variants, so if you ever see game called “halatafl” and you’ll see different board or a different number of pawns, don’t be surprised. 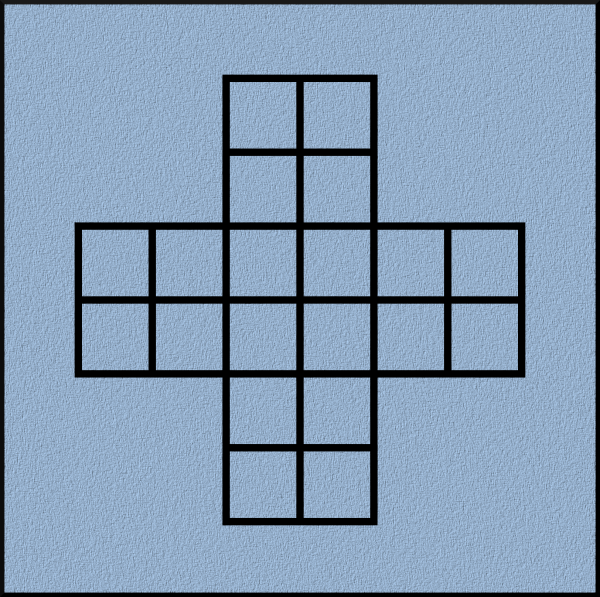 If you read about games you can encounter the term “tafl family” or “tafl games”. Indeed, there is such kind of games although, according to many experts Halatfl is not a typical “tafl game”, but word “tafl” in it’s name can be confusing. To play the game you need a board like the one below. It consists of crossing longer and shorter lines. Intersections on the board are fields, on which you can move pieces. In addition you need 13 black pieces (stones) and only 1 white piece (stone). 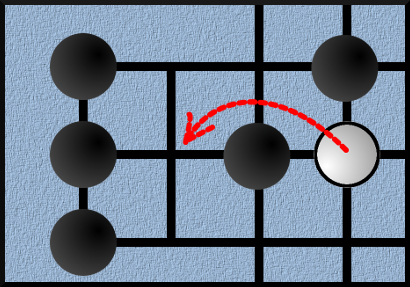 Before playing pieces are set on the board as in the diagram below. As you might guess, 13 black stones symbolize geese and one white stone is a fox. Geese start game, and then players make moves alternately. Both the fox and goose, in one turn, can move from one field (intersection) to neighbouring field connected with line. Goose can not capture fox. Fox can capture goose by jumping over the goose and landing on the free field behind it (in a straight line). 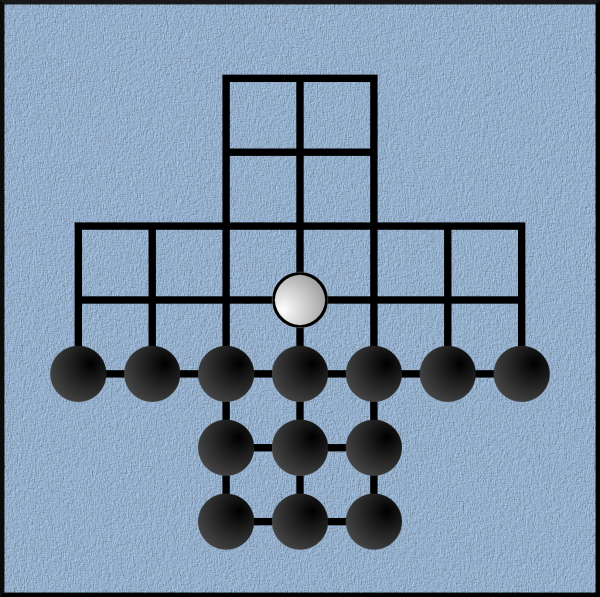 We can say that capturing the goose is similar to capturing in checkers. Fox can capture more than one goose in one move, of course if there is a possibility to make such jumps. There must be free field after each captured goose. Captured goose is removed from the board. Aim of the game is different for fox and geese. Fox wins if he capture all the geese, although in practice capturing eight geese is considered as advantage sufficient to win. Geese win if they block the fox, so that he could not make a move. Halatafl game is relatively simple to understand, and even to make (if we don’t have board and pieces). You can successfully play with the children. Boards and pieces can be sometimes very decorativ, and an additional “ancient” nature of the game it’s something very nice. Matches are not very long. Halatafl is worth a try.